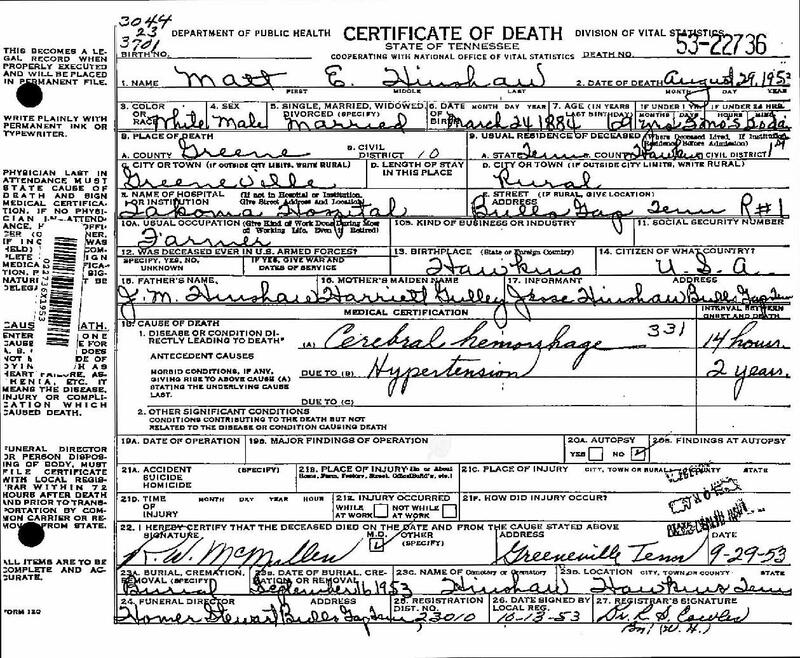 Madison E. Henshaw1,2 [Matterson E. Hinshaw3, Matt E. Hinshaw4,5, Matt Henshaw6, Elastus M. Hinshaw7]. Henshaw, Madison E., head-of-household, age 35, born in Tennessee; parents born in Tennessee; owned home; farmer. Henshaw, Laura M., wife, age 39, born in Tennessee; parents born in Tennessee. 1920 census, 1st Civil District, Hawkins County, Tennessee; roll T625-1745, ED 107, page 7B, line #75, dwelling #144, family #144. 1910 census, 1st Civil District, Hawkins County, Tennessee; ED 106, page 19A, line #3, dwelling #64, family #64.